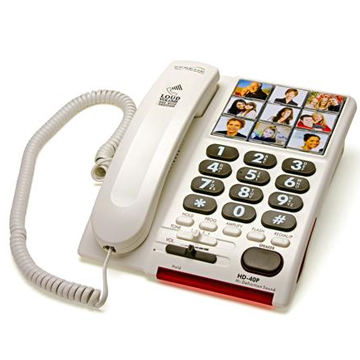 Serene Innovations HD-40S Amplified Photo Phone with Speakerphone All new design….High-Definition amplification….20 times louder…Digital speech enhancement….Photo memories….and more! This ALL NEW HD-40S features easy to use photo memory buttons and Serene’s proprietary HDS (High Definition Sound) Technology for un-matched voice clarity, making every word vividly clear and easy to understand virtually without any distortion, echo or squealing sounds. With its high performance speaker-phone and powerful amplification, this telephone-line powered HD-40S is ideal for people with mild to moderate hearing loss and for those who would benefit from the ease and convenience of photo dialing and hands-free operation.